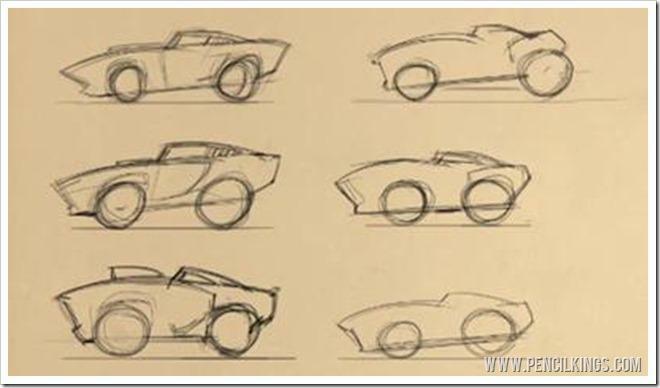 Now that you’ve looked at basic shapes and forms for cartoon car drawing, it’s time to develop these into a series of thumbnail sketches so you can choose your favorite design. So, let’s step on the gas and get moving! At this stage of your cartoon car drawing, don’t worry if your sketches look a little rough – it’s all part of the creative process and it’s much easier to correct any mistakes during these early stages. Try and use your thumbnails to gather all the information you need to create your finished lineart drawing. The side view may not look very interesting at the moment, but that’ll soon change once you start turning it into a 3D sketch! 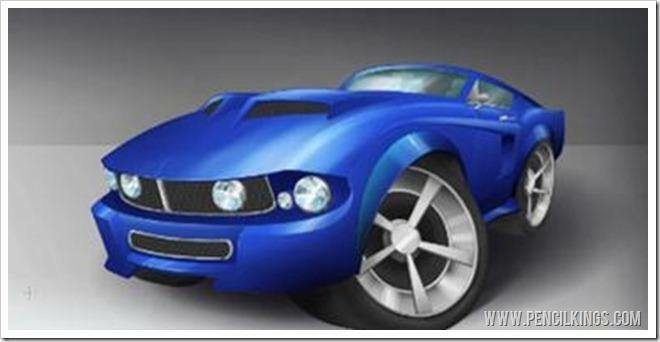 Work quickly and loosely and refer to your reference pictures to make sure your car still looks like a 1967 Mustang – it’s easy to get carried away and lose the shape of what you’re trying to draw. Because you’re working digitally, it’s easy to duplicate and warp your 1967 Mustang sketches to create new ones. You’ll see that you now have a bounding box around your duplicate sketch. Pressing Command (Mac) or Ctrl (PC) will enable you to drag the box out at each corner and warp your sketch for some interesting effects! You can also right-click for more Transform options. Holding down Shift and selecting Scale will enable you to make your sketch larger or smaller in proportion. Selecting Warp will create a grid around your sketch which you can drag to get some really cool effects. You can even draw a marquee around specific areas of your cartoon car drawing to alter them. Here, you can see how April makes the trunk slightly shorter and squashes the roof of the car slightly. 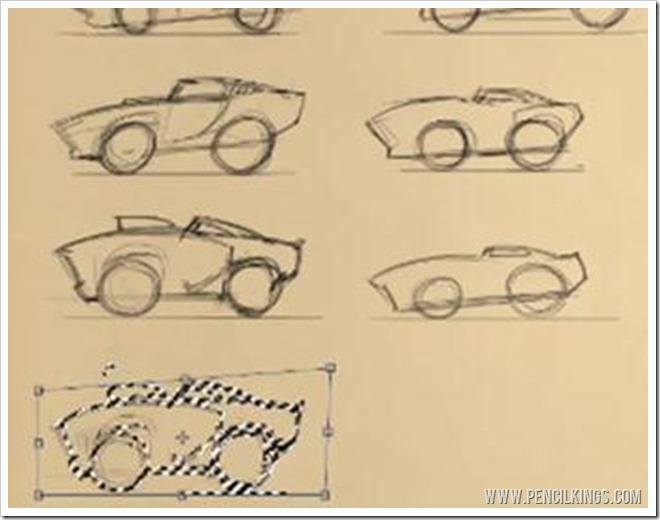 By now, you’re probably creating some wild and wacky shapes for your thumbnail sketch. However, don’t forget to keep going back to your reference photos to check that your cartoon car drawing is still recognizable as a 1967 Mustang! Have fun and experiment! In the next lesson, you’ll be learning about structure and using your chosen thumbnail sketch as the blueprint for your final drawing. We hope you’ve learned a lot about cartoon car drawing already, but feel free to let us know how you’re getting on by leaving us a comment – we’d love to hear from you!